Tag Tuesday, and the lovely Wilma is our host. to fit the new year. She has chosen the theme of new beginnings. I made a sewed, fabric tag. 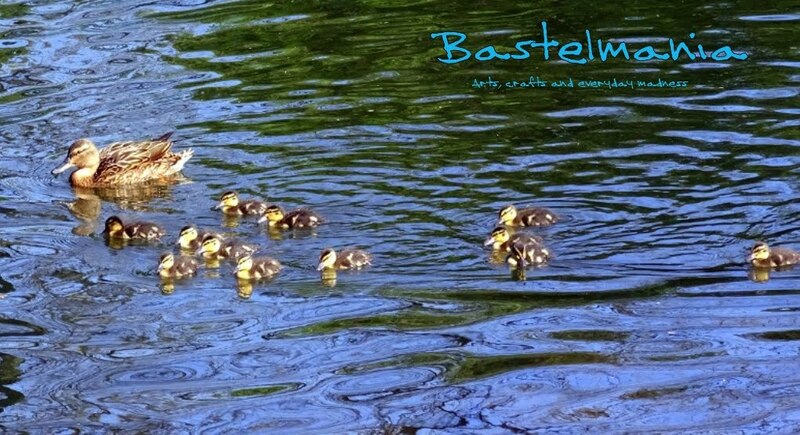 of spring-time, new life and new possibilities. all of the nice ladies of the T Gang. This is a mug warmer! will surely have a lot of fun! Thanks again to all for your generosity! Happy New Year Valerie - good to hear you are feeling much better. What a jam packed post to start off the year with so much to see. Your tag is beautiful and your cake very - very yummy! What a fabulous selection of goodies to have lots of fun with - enjoy! So pleased you are feeling a lot better. This post was super to read. The tag is gorgeous, but I was quite drawn in by the photo of that delicious boozy cake you made. The description to its making was great. Enjoy your goodies, I'm sure you will have fun using them. New Year wishes for a healthy, happy New Year. Happy T day wishes as well. This post is filled with AMAZING creations!!! 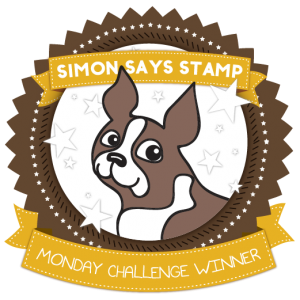 Thank you for playing along with us over simon says stamp monday challenge!! We all hope to see you again soon and we all wish you an AMAZING and CREATIVE 2018! Happy New Year Valerie. I love your delicate floral tag. And the cards you received were so gorgeous. I especially love the rabbit. Bye for now. Glad to hear you are feeling better. Such a wonderful blog post with so much to see. Your tag and sentiment are lovely. I also love the Dream/Dreamer page. Both these items make me think of my daughter as she starts her new adventure. Use all the fantastic bits and bobs you received in good health and creativity. Can't wait to see what you make with them. Happy New Year! Happy New Year Valerie, glad to read you're starting to feel better. A great post today, lovely tag and artwork. A great selection of cards and goodies which I'm sure you will enjoy using. What beautiful gift cards! A boiled fruit cake sounds interesting and it looks delicious! Lovely work for the challenges and I am glad you are starting to feel better! Happy 2018 to you too, Valerie. That tag you created is fabulous and over the top. You got a lot of lovely gifts for your birthday and Christmas. It just shows how loved you are by people far and wide. I got excited to see your birthday cake. It looked wonderful. I wish I could bake like you. You are a fantastic baker. And of course, your cappuccino must have hit the spot in that beautiful mug. I remember that fabulous Second on the 2nd post from before. You really ARE a dreamer, and the head you chose was so YOU. 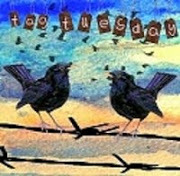 Thanks for sharing both your Second on the 2nd and your T Stands For Tuesday post with us this week. Oh my gosh, what a treasure trove. I can't begin to pick what I like best. You are much loved. Glad you are better. Wishing you a New Year filled with good health and happiness. Such a lovely post to read and look at. Loved seeing all your cards and gifts. So pleased you are feeling a little better too. You are sharing some fabulous things here, Valerie! But the best news is that the antibiotics are working! Great fun to see your beautiful art from friends near and far and the wonderful photos of course! Wonderful project and great gifts! Happy New Year!! Love the art and then there is the cake... if it wasn't for the big pond between us I would have joined you for cake and maybe swiped a sheet of that music tissue paper :) Thanks for stopping by for a visit earlier today ! I forgot to mention, since I was having trouble with my keyboard, that I am delighted the antibiotics are starting to work on your bronchitis. That's the best news of all. Keep getting better, dear Valerie. Wow your post is just packed full of everything wonderful. so glad to read you are feeling better-bronchitis can really wear one down. this post is jam packed with wonderful things-wow! Love your fabric tag for the new year-so pretty. So many lovely cards and gifts you received. Glad you're feeling better and can enjoy your cappuccino and cake. Happy T day and a very happy NEW Year too! Wonderful gifts and art Valerie! A happy and creative 2018 to you! Wow, so many wonderful art gifts from friends! Lucky you! I love your dreamer art. It has a surreal, cool quality to it. Lovely stuff. And your fruitcake looks amazing! I wish I could eat it, LOL. That fruitcake looks luscious. Love the marzipan. Hope you are feeling better and that your day is filled with sparkle. I love the colors in that cup, and the cake... the cake looks _delicious_! Glad you're finally getting over the bronchitis, Valerie. Lovely tag and I love the new theme for Tag Tuesday, so I hope to join in. Time will tell. Belated Happy Birthday! Your cake looks quite intoxicating – lol. This is another new recipe to me. The album from Chrissie is delightful. I’d love to flip through it and see all the special little details. The reindeer mug warmer is a hoot! I’ve seen the term “tip in” a few times among the T-ladies’ blogs, but just didn’t get it. So I searched the web. Wow – there will be tip ins in my future! What a fabulous gallery of handmade cards for your birthday and Christmas! I am so glad to know you are feeling better. Your art touches people and that is what I see every time I come to your blog. 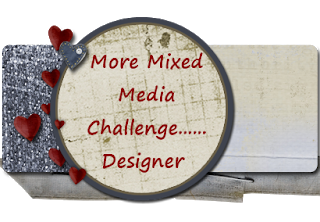 Lovely take on the challenge and marvelous post full of inspiration! Happy New Year! Your fabric tag is so cheery despite the snow and cold weather. I love the texture. And what beautiful gifts you received from friends. Happy New Year! Loved this post! omgoodness Valerie! I am so very glad to her you are on the mend! Glad they put you on antibiotics to kick that nasty stuff out, bronchitis is NO fun! A super post filled with some beautiful gifts from your friends! Lucky you! Hoping you feel better and better each day and sending healing thoughts your way! Such a great post Valerie!! I'm happy you are feeling better! Please keep taking care of you!! Love your 2018 tag! So pretty! I love that fruit cake you made for your birthday! Looks so yummy! And, lucky you, with all the special gifts you got! You are worth it!! Happy New Year!! Wishing you many blessings! Big Hugs! Fabulous tag, and what lovely cards and presents. Pleased you are feeling better. Happy New Year, and thank you for the card. Wow! As always, your posts are a visual feast and I enjoyed this so much! I loved the originality of your project and how you incorporated fabric so cleverly. I'm also glad that you're on the mend! 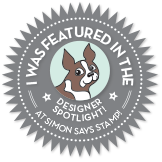 Can't wait to see what else you inspire us with here at the Simon Says Stamp Monday Challenge Blog!